On 19 September 2017, it was announced that the Catholic Church, along with 40 to 50 members of the Security Council’s UN Mission to Colombia, will monitor and verify the temporary bi-lateral ceasefire between the Colombian Government and the the National Liberation Army (ELN). The temporary bi-lateral ceasefire between the second largest guerrilla group, the ELN, and the Colombian Government will commence on 1 October and run until January 2018. This is an important step forward in terms of the security for rural communities and something they and NGOs both national and international, including ABColombia, have been calling for. There will be 40 or 50 United Nations observers supported by the Catholic Church, the UN observers will be located in municipalities with good communications, which are historically the areas of greatest conflict with the ELN. The main function will be to receive information and prevent incidents in the cease-fire based on information received. Juan Camilo Restrepo, Head of the Colombian Government Peace Delegation: Unofficial translation. 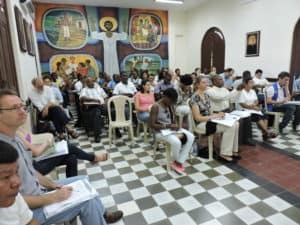 Original: “Serán 40 o 50 veedores de Naciones Unidas que estarán acompañados por la Iglesia Católica, los de la ONU se ubicarán en los municipios que, teniendo buenas comunicaciones, sean históricamente las zonas de mayor conflicto con el Eln. Su función principal será la de recibir informaciones y prevenir incidentes en el cese al fuego con base en informaciones”.